"Lime-tomato dressing with a jalapeno kick makes for a great summer salad. Add 1 cup of cooked chicken or shrimp to make a main dish." 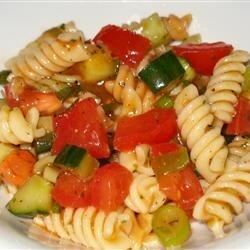 In large bowl combine pasta, onion, bell pepper, jalapeno, tomatoes, cucumber, oil, salt, garlic, lime juice, black pepper and tomato juice. Toss well and chill in refrigerator for 2 hours. Toss again before serving. Needs some element of salt. It was good but I am still on my search. I added shredded cheddar cheese, parm, and lil apple cider vinegar. This was fantastic. I substituted a jar of salsa for the tomatoes, tomato juice, jalapeno and bell pepper. This recipe was outstanding. I loved the jalapeno pepper in it--gave it a just-right kick! Excellent summer pasta salad. Light and fresh with the perfect combination of veggies and and a little spice. I recommend adding more seasoning. We added Greek seasoning at the table, and it was the perfect touch.